On June 21, 1897 a restoration preacher named Clarence Mitchell began a series of revival meetings. These meetings were held in the Butler School, Perry Township in Allen County, Ohio. The revival resulted in 45 additions over two Lord's Days. In 1948 Jack Hanna, a student at Cincinnati Bible Seminary, was invited by the ladies to come and preach. This meager beginning was the start of a revival at Rousculp. Attendance increased and members were added. Ministers over the years were Delmar Rodgers, Ronald Harshe (a Timothy of the congregation), Bruce Smith, Darrel Dearth, Verle Libby, Allen Fehl, Ivan LaVallee who was called to return to this ministry. 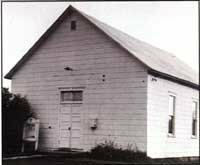 On July 22, 1951 a building program was approved to construct a new building for the church. Resurrection Sunday services were held in the completed basement in the spring of 1952. The present sanctuary was completed just before Resurrection Services in 1962 and the original building was torn down in the spring of 1962. During the summer of 1992 a building program was approved by the congregation for building an addition for new classrooms and a fellowship hall. The new addition was dedicated on May 1, 1994. After a combined ministry of over 30 years at Rousculp, Ivan LaVallee announced his- retirement December 8, 1994. The congregation began looking for a new minister. In the summer of 1995 Mark Vernik was called to Rousculp and began preaching in August of 1995. Mark served as the Senior Minister for nearly 16 years. On February 28, 2011 Mark Vernik was asked to serve as the Allen County Board of Elections. Kenny Radar was selected to serve the congregation by the summer of 2011. The congregation continues to grow upon the seeds of love and dedication planted in the lives of those who were before us. We are thankful for the Lord's work through those who have served before us and those who have been added by the Lord into the body recently!